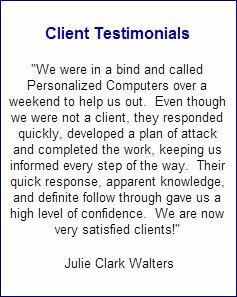 Personalized Computers is a technology solution provider. Since 1998, we have offered the local community a source for honest and straight-forward answers to their questions about computers. Our foundation was built on our integrity and dedication to customer satisfaction. As a computer manufacturer, we are able to provide high-quality computer systems that are backed by a local support staff. Our computers will fit virtually every need from basic home use to professional grade video editing. Anyone can build a computer, we personalize it! Every computer has all the same basic functionality. We are interested in knowing how you intend to use it, what other applications you will run, what your budget will allow, what features are most important to you. Once we have determined your wants and needs, we will put together a quote that is just right for you or your organization. Our ability to address IT needs goes beyond our computer systems. We also offer the same quality and local support on laptops, servers and tablet PCs. Our network engineers are ready to design your new network environment or improve your existing network. We offer network evaluations, security audits, network security appliances, network hardware, data cabling, document imaging, regularly-scheduled maintenance, or remote management. Whether you are in need of a new file server, running Exchange, implementing a SAN or virtualizing multiple servers, we have a solution for you. Much of our ability to support our clients' needs can be credited to the strategic alliances that we have forged with the best-known names in technology. As a partner with Intel, Microsoft, Ingram Micro, AVG, Seagate, SonicWALL, APC, NEC, Fujitsu and Samsung to name a few. We are able to pool resources and provide a level of customer satisfaction beyond what we could do on our own. Home, Business and Enterprise solutions under one roof.